Experienced wedding string quartet with an expansive repertoire of music that will create the perfect ambience for your special day. 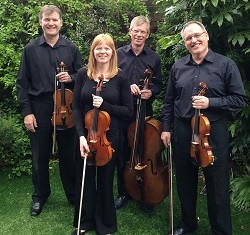 The string quartet provides music of the highest standard for wedding civil ceremonies and church services, wedding receptions, wedding breakfasts, for corporate events and for private parties and family celebrations. The quartet has a huge repertoire of music ranging from Bach, to Scott Joplin to Jagger and is sure to be able to satisfy every musical taste. If our clients have a particular favourite piece of music that's not in our repertoire then we will try to source this for the them. The quartet enjoys working with all of it's clients so that together we can ensure that the perfect atmosphere is created. The Basic Net Fee is for a wedding ceremony/service booking for the string quartet. Professional musicians, immaculately attired, perfect choice of music, made perfect day super perfect - thank you all. We would both like to say a huge thank you to the quartet for a superb performance. You were extremely professional and your music really made our day special. Options: We also offer a violin and cello wedding duo which is ideal for the smaller wedding or function or where the budget may be limited. The electric string quartet will require a double power socket.